TODAY: The Mudcats conclude the 2018 season today while playing the final game of a split, home/away, four game series versus the Buies Creek Astros at Jim Perry Stadium. The Astros defeated the Mudcats 2-1 in a rain-shortened game yesterday at Buies Creek and lead the current series 2-1. Today's game is the 28th and final meeting between the two teams this season. The Astros lead the season series 16-11. ICYMI: Cooper Hummel had two hits including a RBI double that came moments before a heavy storm stopped play in the middle of the fifth allowing the Astros to escape with a 2-1 rain-shortened victory versus the Mudcats on Sunday afternoon at Jim Perry Stadium at Buies Creek. EXTRA, EXTRA! : Carolina's lone run scoring hit in yesterday's rain-shortened game was a RBI double from Cooper Hummel in the fifth inning. 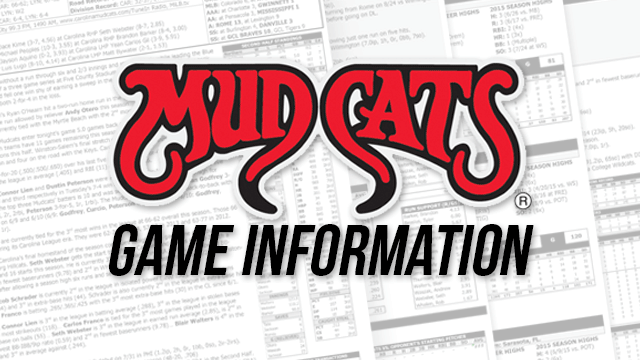 The Mudcats have now totaled 18 extra-base hits out of 31 total hits over their last four games. Those 18 extra-base hits include a season high 8 XBH (4 2B, 1 3B, 3 HR) on 9/1 vs. BC and 7 XBH on 8/30 vs. DE (4 2B, 1 3B, 2 HR). PUMMELING HUMMEL: Cooper Hummel has reached base safely in 27 consecutive games (.513 OBP during the streak) and currently leads the Carolina League in OBP (.398) this season. Overall, Hummel is batting .260/.398/.412 this season and is currently 6th in the CL in OPS (.810). Hummel is also 4th in the CL in wRC+ (137) and 4th in wOBA (.383) according to fangraphs.com. Hummel has additionally played in 54 consecutive games (.310/.466/.503, 21 2B, 4 HR, 30 RBI, .969 OPS since 7/5) and leads the CL in OBP (.449) and OPS (.946) in the second half. DOWN WITH OBP: Cooper Hummel currently leads the Carolina League in on-base (.398) and is looking to become the first Mudcats player to finish a season as the league leader in on-base since Jeremy Hermida led the Southern League with a (franchise record) .457 OBP in 2005. Former Mudcats to lead the Carolina or Southern League in OBP: Jeremy Hermida (.457, 2005), Josh Willingham (.449, 2004), Todd Sears (.434, 2000), Jason Kendall (.414, 1995). TRENDING: OF Dillon Thomas is batting .353/.500/.412 with a .912 OPS over his last 10 games (12 H, 7 R, 5 RBI, 10 BB, 13 SO)... C Robie Rojas is batting .310/.394/.345 over nine games since returning to the Mudcats on 8/5 (9-for-29, 5 R, 2B, 4 RBI, 3 BB, 12 SO)... INF Nick Roscetti is batting .286/.474/.357 over his last five games (4-for-14, 4 R, 2 RBI). HITS AND Ks: The Carolina offense has totaled 257 more strikeouts than hits (1,302 SO, 1,045 H) so far this season. Carolina's difference in strikeouts over hits is the 4th largest in MiLB. Since 1991, only the 2017 and 2007 Mudcats have finished a season with more strikeouts than hits. Carolina totaled 164 more strikeouts than hits in 2017 (1,245 SO, 1,081 H) and 70 more strikeouts than hits in 2007 (1,219 SO, 1,149 H). RECORD SETTING: Carolina batters have combined to total a Carolina League record 1,302 strikeouts this season (8th most in MiLB). The Carolina offense struck out a CL and franchise record 1,245 times last season... The Mudcats hit into a franchise record six (6) double plays 8/10 in Salem (Dallas Carroll: 5-4-3; Devin Hairston : 6-4-3, 5-4-3, 5-4-3; Trever Morrison: 3u-3-6; Rob Henry 6-4-3)… The Mudcats pitchers set a franchise record for strikeouts in a nine inning game after totaling 19 strikeouts on 5/31 in Lynchburg (Marcos Diplan: 10 SO, Chase Williams: 3 SO, Phil Bickford: 3 SO, Luke Barker: 3 SO). WHERE THEY RANK: OF Cooper Hummel currently leads the Carolina League in OBP (.398), 6th in OPS (.810) and is tied for 3rd in base on balls (63)... RHP Luke Barker leads the CL in saves (20) and games finished (38). Barker is also 2nd in games (46), 4th among CL relievers in lowest batting average (.213), 1st in fewest baserunners/9ip (9.30), 5th in highest strikeouts/9ip (9.30) and 5th in lowest BB/9ip ratio (2.36)… INF Dallas Carroll is currently 1st in the CL in games played (133), 2nd in at bats (505), tied for 2nd in most walks (64)... INF/OF Ryan Aguilar is tied for 1st in the CL in triples (9), tied for 2nd in base on balls (64) and 2nd in most strikeouts (137). WALK IT OFF: Seven (7) of Carolina's last 11 home wins occurred in walk-off fashion (7/19, 7/24, 7/25, 8/4, 8/8, 8/17, 8/28). Those seven (7) walk-off wins additionally occurred over Carolina's last 21 home games. Overall, Carolina totaled 12 walk-off wins this season. ... Averaged the 2nd fewest runs per game in the CL (3.93). ... Totaled the 2nd fewest runs (538) in the CL this season. ... Allowed the 6th fewest runs (595) in the CL this season. ... Totaled the worst K% (offense) in the CL this season (25.8%). ... Totaled a CL high 16 losses when leading after 6 innings. ... Totaled a CL high 12 losses when leading after 7 innings. ... Have totaled 12 walk-off wins this season. ... Gone 24-24 (.500) vs. the CL Northern Division. ... Made 105 total roster transactions this season.